Download our Product Catalog as a pdf file. View our latest Product Catalog Online. Our 30-page product catalog makes a perfect hard copy reference for any individual or department involved in purchasing materials. Each page describes products, features, descriptions, specifications, applications and industry use. 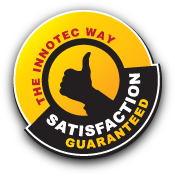 Enjoy the Innotec way in your hands today! To receive your free catalog, please complete and submit the request form. Your information will remain confidential and will not be shared or sold with any outside companies.